It's been a long wait, but summer and outdoor dining peaks on the Fourth of July. So with a little advance work, you can have your parade and party too, and still feel like you had a lazy day of summer in the end. Plan your meat course first, whether it's burgers and dogs or ribs, besides setting your table, you need to know what time you'll need to invest in your main course so you can budget the rest of the countdown to festivities accordingly. Because our family's day includes participating in the Hailey parade every year, and a 91-year-old great grandpa born on the Fourth who comes in from Jerome for about two hours to eat with us, we have to get the ribs going early, eat on time and be ready for the rodeo that night. At least 24 hours before, shop for your ribs. Ask the butcher at your grocery for baby backs with the silver skin removed from the ribs, "It will make them much more tender," Shaun Mahoney, of Mahoney's in Bellevue, says. Use a sweet and smoky dry rub from the spice aisle and apply it right away to both sides. The longer the better. Keep meat refrigerated. Put ribs in a smoker at 170 degrees for eight hours using a mixture of wood chips of hickory and cherry. When they are done, you can finish them on a hot grill and baste them with your favorite barbecue sauce to give them a nice glaze. Portion while hot, and "finger" the ribs by lifting them with a knife slightly away from the bone for easy eating. We're all about the slaw in the South, but I found that my yellow mustard-based style doesn't set well with my fifth generation Idaho husband and the inlaws so I asked Keith Perry of Perry's Restaurant in Ketchum for the tricks to his crowd-pleasing coleslaw and potato salad. Blend in food processor, toss with vegetables. Of course you'll want watermelon and apple pie, but a good old fashioned root beer float adds nostalgia to the afternoon. Kainoa Lopez, who brews BuckSnort root beer locally, (and provides it for the Sun Valley Center of the Arts post-parade ice cream social in Hailey), lent us some to mix with another local favorite, Toni's ice cream. Toni Bogue rose to the challenge to make exotic choices for mix-ins, choosing Crème Caramel (crowd favorite), Ginger, and Vanilla Bean from her homemade Sun Valley Ice Cream Company. Add straws and spoons and you have a party in a mug. Don't have a lot of stars and striped items in your cabinets? Don't sweat it. 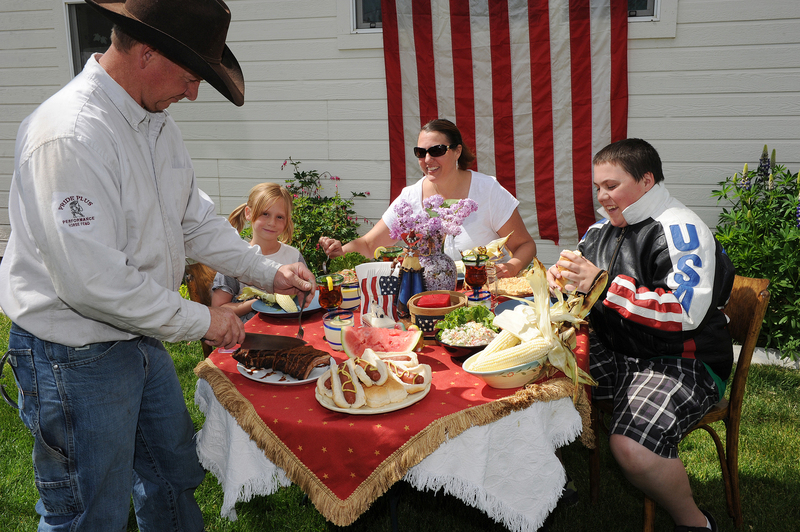 For this setting, we shopped at local thrift stores, Barkin' Basement (Hailey), and Advocates Attic (Hailey) and The Gold Mine (Ketchum) who lent us most of the items used to decorate from mini flags to the bobble head cowboy (off the market, we bought it after the shoot). Just add music, summon the guests and smile, it's really summer now.